ClubCoins Needed: 216 Please note that this item is not available on your device. You may add the item to your Wish list and redeem from a compatible device. "e;Steve Chandler's coaching has had a tremendous impact in my life. He was vital to my personal transformation from a man of ideas and dreams to a person of action and reality. "e;--Radames Soto, former managing director, The Wall Street Journal"e;Steve Chandler lights you up with the glow of his internal neon--what he proposes is so rock solid and reassuring. "e;--Lisa Schnebly, Th… e Arizona RepublicThe world of leadership has changed dramatically since 100 Ways to Motivate Others was written, and now Chandler and Richardson have revised and refreshed their organizational classic to meet the times.They have crafted a vital, user-friendly, inspirational guide for executives, managers, and professionals--and those aspiring to reach their level. 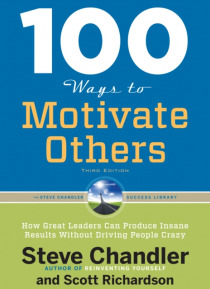 100 Ways to Motivate Others is based on years of successful live workshops, seminars, and personal coaching programs on communication and leadership.This new edition includes fresh insights into communication and rapid decision-making, the importance of personal self-leadership and physical energy, and exciting new methods for enrolling clients and selling to customers in service-oriented ways that leave behind the old paradigm of manipulation and persuasion. The authors will help you learn:How to slow down and enjoy a new level of focus.How to build on your peoples' strengths.A simple and creative way to hold people accountable.How to enjoy cultivating the art of supportive confrontation.